You are here: Home / Ethnic Groups / The People of Sulawesi / Who are the Tomini? The Tomini live in Central Sulawesi province. Their districts stretch from the northeast to the south and form a half circle facing the Tomini Bay. The coastal area is made up of plains. They are narrower to the south, while the coastal regions remain flat, and the interior is mountainous. Many of the valleys in the interior have fertile, irrigated rice farms and the land is well cultivated. Other original inhabitants of this area are the Dampelas, the Balaesang and the Pikoro. The Tomini have their own language, Tomini. Several trade dialects have emerged because of their interactions with their neighbors. 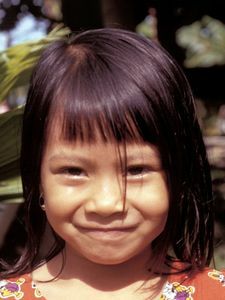 The Tomini language is part of a larger language group called the Nothern Tomini subgroup which also includes Lauje and Dondo. Tomini villages are made up of small wooden houses built on stilts. The Tomini living in the coastal areas farm cloves and copra (dried coconut). Many of them also earn extra income from trading, forestry, or fishing. In the mountains, the Tomini cultivate rice and corn. They also gather rattan to be sold on the coast. The marriage system follows Islamic guidelines. An intermediary talks with the parents of the bride and makes arrangements based on the girl’s status. Marriage is allowed between first cousins. Although polygamy is allowed, it rarely occurs. After marriage, the couple usually stays with one of their families until their first child is born. In the past, Tomini was a sultanate. The sultan and his aides were chosen through the ancestral line. During those times, there were four classes of people: royalty, nobility, commoners and slaves. In the late 1950’s, young people led separatist movements seeking independence from Indonesia throughout Sulawesi. In the Tomini region, this reached a peak in the 1960’s with the Permesta Rebellion. This rebellion almost totally destroyed the local economy. Since then, the government has made an effort to integrate the area into the national and international economic systems. Cloves were successfully introduced and both national and international lumber firms have been established in the area. However, their production has dramatically decreased in recent years. The Tomini people follow Sunni Islam, but they are not fanatical about their faith. Many still hold to animism. They believe spirits indwell inanimate objects, and many Tomini mix worship of their ancestors and nature with Islam. At this time, the Tomini need improved infrastructure to market their produce. They need increased trade to overcome the lingering weakness in the economy which has never fully recovered from the economic destruction of the Permesta Rebellion.